Who doesn’t want to fill their luggage with nothing but books? This will be our last page of the year, enjoy! We will see everyone on the 2nd of January. Have a great holiday, and a happy New Year! As always, thank you ever so much for your feedback and support. Lol, Faye he said that you guys were going to take the train, not to wear one! Ooooh I just thought of something, does this mean that the leopard gets to come along now? Since she’s home now and her leopard is probably sleeping somewhere nearby…. Right, so because we’ve spent so much time the past few weeks discussing how awesome and hilarious Lenna is, Faye has decided to do something awesome and hilarious to compete. if Lenna help her young friend get better outfitted. It also cracks me up that she’s carrying that heavy suitcase of books with one hand in panel 2, yet Accel can barely lift it with two. Pretty girl is stronger than she looks! Anyway, here’s to a joyous holiday season to all of you at Amya! Break? Aww. *sniffle* Have a happy holiday and New Year! Faye probably just wants to look pretty today, after all that time wearing the torn and travel-stained dress, being covered with bandages, etc. They can’t get all those books with them in a single suitcase… But if everyone carries a few books with them, they can bring more than a few books with them. It is a pretty wicked dress. All of Faye’s wardrobe is actually based on the works of Charles Frederick Worth, predating 1890. I er. Um. Well… Yeah. Not Books. Tomes. Levels 1-8 of illusion and fire magic hopefully. Reminds me of when we had to move. Not fun, but I leave no book behind! 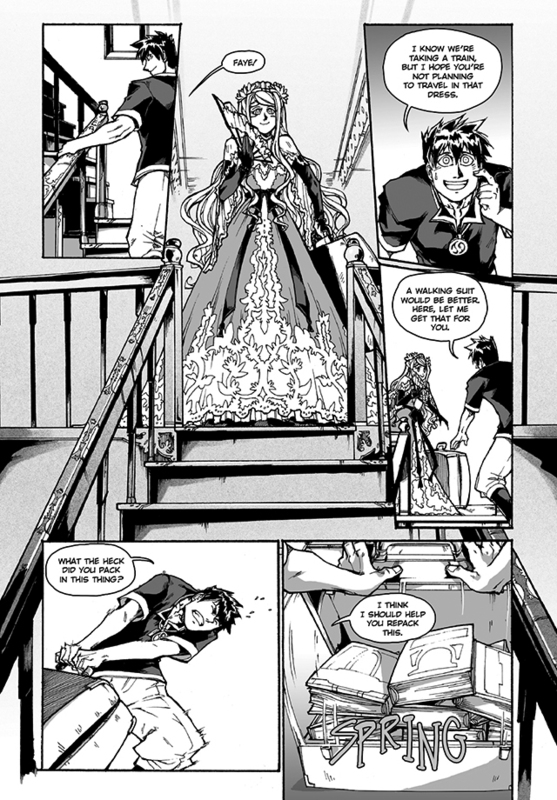 That dress and Faye cry for coloring and a wallpaper layout. And I don’t know what his problem is. Doesn’t everyone pack 7 or 8 tomes in their carry-on luggage, like me and Faye? Have a good holiday and we’ll see you next year! It’s like Titanic/Anastasia- lady at the top of the stairs looking pretty, fella at the bottom looking a little flustered. Girl’s got a beefy arm if she was carrying that so effortlessly. Just last night I packed a bag like that. heh, when I was a kid and had to spend my summers in Wisconsin, I had a suitcase that looked very much like this, packed to the gills with Sci-Fi club and Robert Jordan hardcovers.